Integrated and intelligent micro mold solution, handling and control system for micro parts production. The R&D project I4M - Innovation in Micro Mold and Micro Handling aims to carry out a research that will enable the consortium to establish and validate a new tool paradigm for micro parts, materialized in an intelligent integrated solution consisting of micro mold, customized handling system and respective control. The challenge is to reduce costs, reduce waste and optimize time production by reducing material used on the sprue and with personalization of piece in molding process, reinforcing the ranking of the supplier in the market. 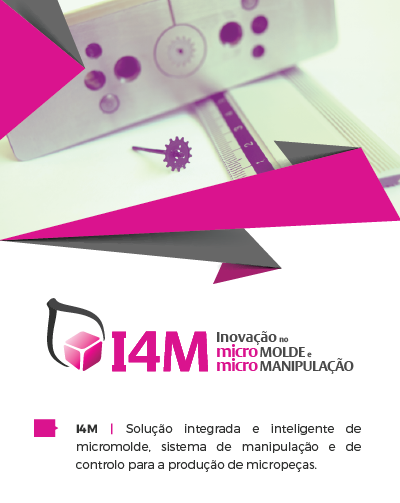 I4M aims to develop a manipulation system for micro parts, that is seamlessly integrated with micro mold to make the loading, unloading and assembly, meeting the dimensional, geometric and appropriate way to the level of accuracy required by the customer, and by the operating conditions tolerances. Edilásio Carreira da Silva, Lda. Micro parts, micro molds, micro handling, robotic, computer vision, sensing.